It’s pretty well-known among game design circles that our brains have certain fundamental bugs. Taking advantage of our logical fallacies and psychological quirks can let us do pretty cool things, but we game designers have a responsibility to do things that are mutually beneficial to our customers and our wallets. The patron who requested this article asked about Farm Story 2, “Please help me: why can’t I stop?” Here’s why. Farm Story 2 is a fairly standard business management game, sans the business management. You plant crops and buy animals, and then you return periodically to collect the product (in the pigs’ case, you collect bacon from their living bodies). You replant some of the seed, feed the animals, and fulfill random “orders” for assorted product. Sometimes you use buildings to convert raw materials into more complex materials. There are no maintenance costs, no market trends: nothing to plan for or strategize about. You just tap all the things that you can tap, then wait until you can tap more things. There’s a base-level pleasure to this action. The processing fluency theory of aesthetic pleasure is a theory of psychology that says that things we can easily understand or process are aesthetically pleasing. We enjoy understanding what’s going on and seeing the pattern in it. By making a simple system that we can demonstrate understanding of, even when tired or busy, FS2 ties into that base desire. To take full advantage of this, a designer needs to disguise the source of the understanding. To put it another way, if you realize that you understand something just because it’s simple, you’ll be less satisfied. This ties into Raph Koster’s Theory of Fun, which proposes that the fun in games arises out of mastery of complex systems. FS2 provides Nilla Wafer levels of simple satisfaction, but its systems aren’t complex enough for actual mastery. Not to worry, though. By the time you realize how shallow the game is, it’s hooked you with another flaw in your brain patterns: the mere-exposure effect. You like things which are familiar, even if only through repetition. In Farm Story 2, wheat takes 120 seconds to grow. Corn takes 240. Each time one of these crops completes, you get a push notification: “You have Wheat (sic) ready to harvest!” If you respond to even half of these notifications, you’re opening the game up every few minutes. This game will become familiar to you before you realize it has little to offer. You’ll also become familiar with Storm8’s other products. 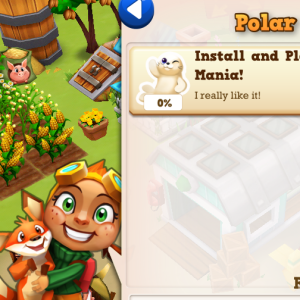 As mentioned earlier, the characters in the game will implore you to install other games by the same company. These notices appear in your quest log alongside actual game goals, and these requests are in addition to the more normal interstitial advertisements that appear every time you open the game. As a result of these advertisements, you’re more likely to download those games if you come across them elsewhere. Even if you don’t recognize them, hey’ll seem pleasant, thanks to the brainwashing you got from Farm Story 2. As you get into the game, you’ll soon run out of space in storage or on your land. In order to upgrade or expand, you need certain resources that you can only get from fulfilling orders or clearing underbrush (which consumes tools)1. These resources, however, arrive randomly. They only sometimes appear, and when they do they are selected from a long list, which means that you only rarely get the specific resource you want. This takes advantage of the Partial Reinforcement Extinction Effect, or PREE. If you put a pigeon in a box and let it pull a lever to get food, it will pull that lever quite a bit. However, if that lever only sometimes gives food, the pigeon will pull the level more urgently, and it will take longer to give up on pulling the lever when the food stops coming. Farm Story 2 trains you to keep playing it in the same way that Pavlov trained his dog to drool on command. If you play Farm Story 2 or a similar game, you probably recognize these things. You’ve already realized that the game’s appeal lies solely in its simplicity and familiarity, and you’ve probably already felt uncomfortable with how excited you get when the tedious order fulfillment finally gives you the land permit or seven that you need. You want to stop. Why don’t you stop? Because you’ve already spent so much time on it. You’re suffering from escalation of commitment. Related to the behavior surrounding sunk costs, this phenomenon means that we don’t like abandoning behaviors that have already cost us effort and resources. We don’t want to leave a bad movie because we’ve already paid for the ticket. We don’t want to lose an auction even when bidding exceeds an item’s value. We don’t want to leave Vietnam because so many people have already died. Because you have invested time in this game, quitting it feels like an admission of failure. However, every additional moment spent playing it is another moment lost, increasing your sunk costs. The sooner you quit, the less you will have lost. As game designers, we must give as much as we take. Especially when trying to run a business, we choose to take money, time, and effort from our players. We have a responsibility to give something in return. Whether it be mastery over a genuinely interesting challenge, good feelings, an enriching moral question, social interaction, or just a pleasant story, we need to make sure that our relationship with players is mutual and nurturing, not exploitative. In exchange for your time reading this post, here is a gift. If you want an easy, cute game about tapping a bunch of things, making numbers go up, and getting push notifications that things are ready to be collected, download Happy Street. It provides the same brain-stem attractions discussed above, but in exchange you get cute characters, silly story, and a good feeling instead of a bad taste in your mouth. Now I have to go and uninstall Farm Story 2. Thank you. I needed this analysis. You have made my life better today. Excellent analysis–thanks for kicking my brain into gear this morning!